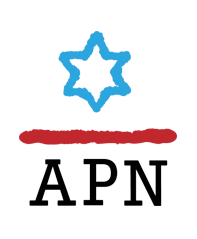 APN Intern Elana Kravitz in Times of Israel Blog: "Parshat Shoftim: A Political Imperative for Liberal Jews"
Elul, the Jewish month leading up to Rosh Hashanah and Yom Kippur, is a time of reflection, soul-searching, and repentance. Even before we reach the holy days designated for new beginnings and atonement, Jews prepare to undertake tshuva, asking forgiveness both from our peers and from God. Each day in Elul, except for shabbat, we blow the shofar to awaken our slumbering consciences and reach out to God, who is held to be remarkably close and receptive to prayers during these weeks of spiritual preparation. At the closing of 5778, Jews in the US and in Israel have a lot to contemplate. The beginning of this month of Elul, in the wake of the recent passage of the Nation-State Law, marks the first Elul officially celebrated by the Israeli government, which legally adopted the Jewish calendar among the other symbolic acts of the law. Maybe the government will take this opportunity to consider its destructive policies and stances that have pushed Israel closer to annexation of the West Bank and undermined minority rights. Maybe, with an eye towards upcoming elections in Israel, Israelis will consider the damage this government has done to Israeli democracy and consider their role therein. The Trump administration has indicated that it will release its Middle East peace plan soon, a plan crafted by a group of unrepentantly pro-settler Jews that will likely infuriate and insult Palestinians while damaging their national aspirations. Maybe Jared Kushner, Jason Greenblatt, and David Friedman will take the opportunity for introspection to recognize how they have undermined peace in the region by emboldening the pro-annexation, pro-settler agenda of the current Israeli government. As we reflect over the past year and the place we had in it, it is easy to find ourselves blameless, prescribe repentance to others, and self-righteously say maybe: Maybe the people in power will realize what they’re doing wrong. But this week’s parsha, Shoftim, urges us to go beyond examining the contents of our souls and take action: “Justice, justice shall you pursue” (Deuteronomy 16:20). Pursuing justice is a goal that by its nature pushes us beyond righting our own wrongs to advocate for the other and condemn injustices. We can’t be content with our own good deeds, or even our own self-critique, but must intercede elsewhere, breaking our reverie of introspection to pursue justice. This passage uses the verb tirdof (pursue), used elsewhere in the Torah to describe chases and hunts, to emphasize the challenge of attaining justice, which seems to be fleeing as we pursue it. Though Elul and the High Holidays bring us valuable opportunities to reflect, we cannot lose sight of the imperative of action, the need to chase down and tackle justice, while we work towards bettering ourselves. This will mean advocating for the disempowered and holding those in power accountable, even when the odds are stacked against us. Along with calling for justice and explaining the basics of good Jewish jurisprudence, Shoftim provides an important reminder to make ourselves heard. The parsha repeatedly stresses the importance of considering multiple narratives, stressing that one witness is never enough to condemn a suspect or understand a situation and repeatedly insisting on at least two witness accounts (Deuteronomy 17:6, 19:15). Even graver than the sin of only giving countenance to one narrative is that of giving false testimony to condemn another (Deuteronomy 19:16-21). The importance of considering multiple narratives and the dangers inherent to false testimonies are apparent in this age of “fake news” smears coming from both President Trump and Prime Minister Netanyahu. In Israel, peace advocates and liberal Jews are detained, condemned as traitors, or barred from schools and Palestinians are seen as threats, allowing the dismissal of anything they have to say. Even in many American Jewish communities, pro-peace Jews are often seen as traitors to their own people. While the political arena may not be a courthouse, we must recognize the importance of giving countenance to the testimonies of witnesses to the occupation. We cannot allow our understanding of the situation in Israel to be hijacked by right-wing censorship or stigmatization. Allowing ourselves to be silenced would be to add another sin to our list of those in need of atonement as the occupation becomes a trial in which the Jewish people are increasingly guilty and silent. So this Elul—and in the year to come—it is incumbent upon liberal Jews not only to consider our past actions, and hope that those in power will do the same, but to raise our voices in protest and resistance. We can’t allow a one-sided, biased, and often false narrative to be used to condemn and silence protesters, activists, refugees, rabbis, and those living under occupation. Like shofarot, we must awaken sleeping consciences and open unseeing eyes to the reality of the occupation and the realistic prospects for peace. We must pursue justice and peace even if they seem further away than ever.